White Deer Park officially opened on November 1, 2009. With five shelters, two playgrounds, two miles of paved trails and a 2,500 square foot nature center, it is the largest municipal park in Garner. Please contact 919-661-6982 if you have further questions or need more information. Hours of Operation: White Deer Park is open from sunrise to sunset daily. 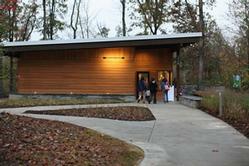 The Nature Center is open Tuesday-Saturday from 9am-5pm and Sunday from 12-5pm.